This is a popular question that I will provide the answer for. 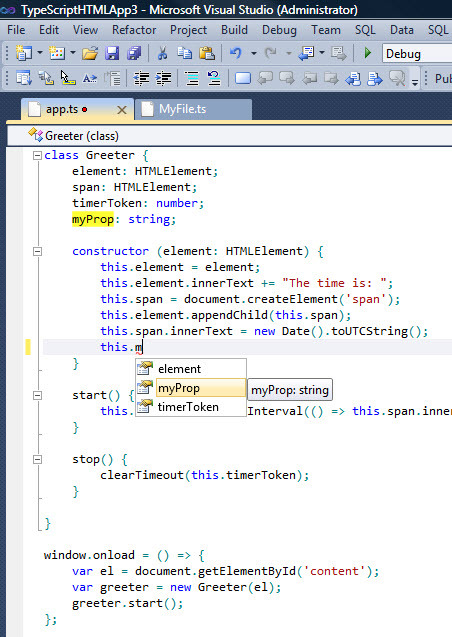 Typescript 0.9.5+ have a dependency on Microsoft.VisualStudio.Shell.11.0.dll. Therefore, these instructions will no longer be updated. The following is provided for educational purposes. Please adhere to all licensing and redistribution requirements. For prior versions of TypeScript, please see the edit history for this answer. 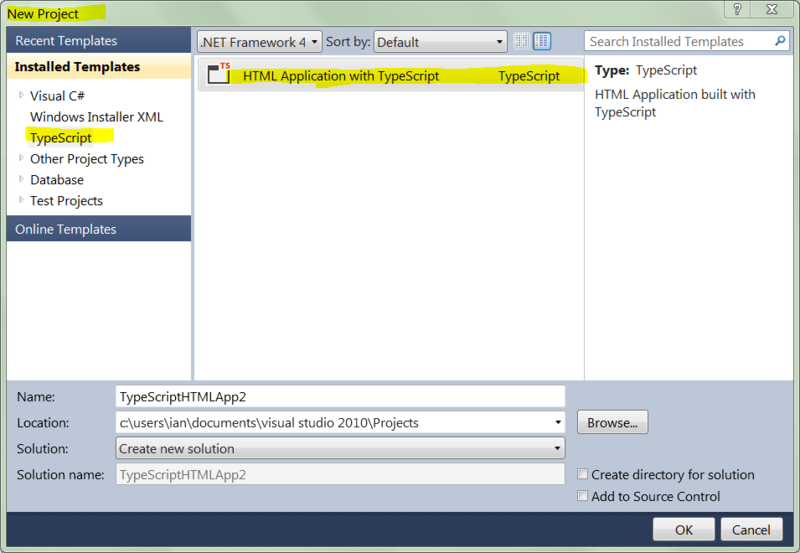 Download TypeScript for Visual Studio 2012 version 0.9.1.1 and place the installer executable in its own temporary directory. Open a command window in the temporary directory. TypeScript_CORE.msi /l* log.txt VS11_EXTENSIONS_DIR="%VSDir%\Extensions\Microsoft" VS11_NEWSCRIPTITEMS_DIR="%VSDir%\NewFileItems" VS11DEVENV="%Devenv%" VS11_TARGETSINSTALLFOLDER="%ProgramFiles(x86)%\MSBuild\Microsoft\VisualStudio\v10.0\TypeScript"
Edit TypeScript_CORE.wxs replacing the lines shown below. To avoid possible copyright issues and due to size limitations on StackOverflow, the entire updated file has not been posted. The best I can do is post a diff report. Numbers in the first column are line numbers for the original file. Numbers in the second column are the line numbers in the edited file. The line numbers in the edited file will be lower due to deleted lines. Execute the command TypeScriptVista.msi /l* log.txt VS11_EXTENSIONS_DIR="%VSDir%\Extensions\Microsoft" VS11_NEWSCRIPTITEMS_DIR="%VSDir%\NewFileItems" VS11DEVENV="%Devenv%"
Existing projects will need to have the following elements added to the bottom of the project file. Note the elements that have been added prior to the BeforeBuild element. Uninstalling may need to be done twice before TypeScript no longer appears in the Programs and Features list. After uninstalling the first time, refresh the application list by hitting F5. Some files may still be present after uninstallation. The new project type and item type are available. 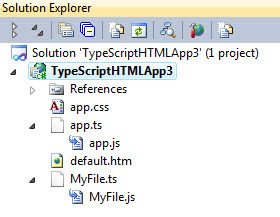 TextEditor\TypeScript section under the Tools\Options menu. Intellisense editing of .ts files. .js files are built on build or on save (when build on save has been set in the text editor options). .ts files are not included when publishing, just the .js files. .ts files have their own icon and are associated with visual studio. Not the answer you're looking for? 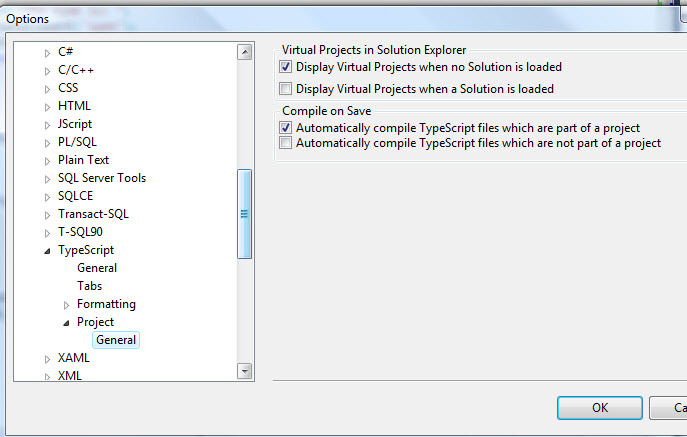 Browse other questions tagged windows visual-studio-2010 installation typescript or ask your own question. downloaded a typescript file but it is throwing a lot of errors — how can I resolve?